Spinach Florentine with red sauce. I previously reviewed (here) Rising Moon’s frozen White Bean and Kale ravioli and also gave them five stars. Rising Moon has been in business for 20 years beginning with a bicycle delivered ravioli subscription service, and then expanding to include frozen raviolis, foccaccia breads and sauces. This time around I tried their Spinach Florentine Ravioli, which is kind of a redundant name as dishes prepared a la Florentine almost always include spinach and are often accompanied by cheese. The link between spinach and Florence is thought to be related to Catherine de Medicis, who was from Florence and introduced spinach into Gallic cuisine with her marriage to France’s Prince Henry in 1533 (thanks to Saveur for that nugget). 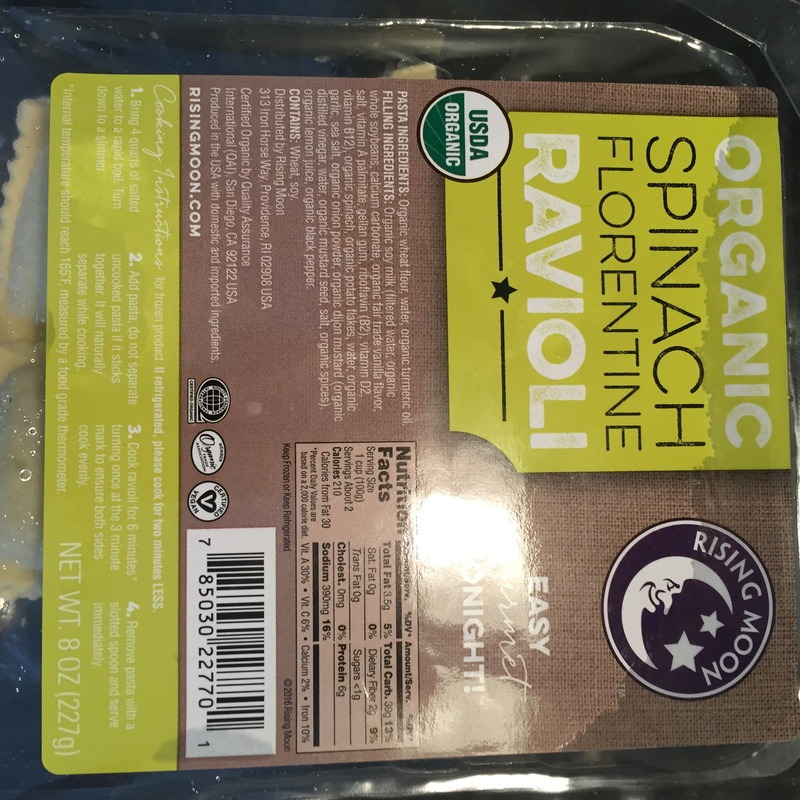 Rising Moon’s frozen Spinach Ravioli are vegan and are excellent. Each package comes with 12 ravioli, which is a hearty meal for one or a good opening course for two. They use soy milk to make a ricotta cheese like filling that the spinach is mixed into. 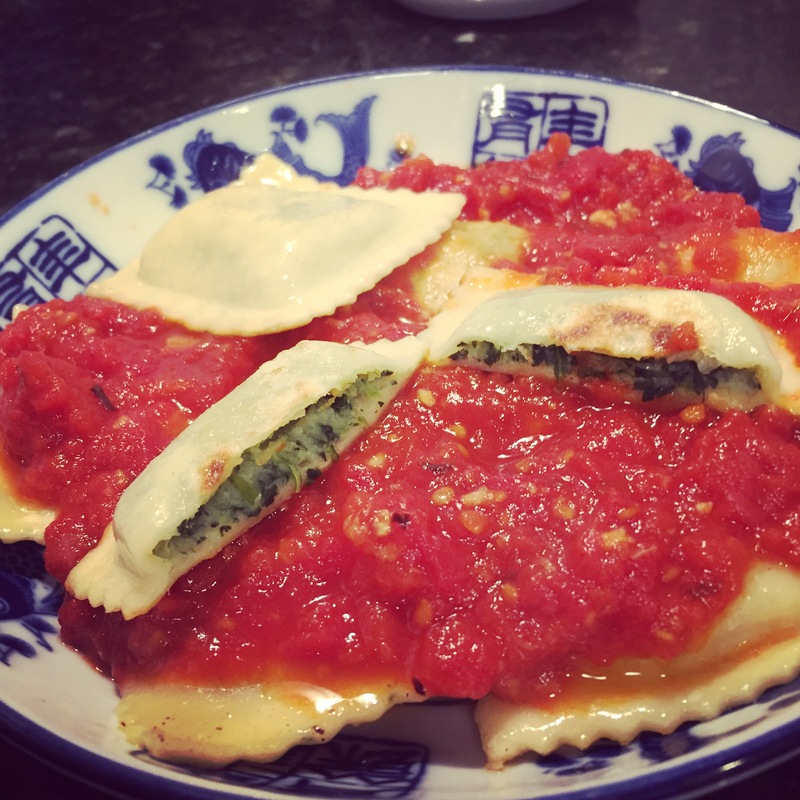 The filling has a pretty convincing ricotta cheese flavor and there is quite a lot of spinach in these ravioli, enough that you can taste the healthy green goodness. I boiled and then pan-fried the ravioli so they were crispy on the bottom, I highly recommend this approach for ravioli. This entry was posted in Frozen Dumpling Review, Ravioli. Bookmark the permalink.